At the tender age of seventeen Paul Signac dropped out of school and immersed himself in the avant-garde life of Montmartre where his family had been living. He soon came into contact with the literary and artistic circles that frequented this hedonistic area of belle époque Paris. Painting emerged as his passion and Signac later cited an exhibition of paintings by Monet in 1880 at the offices of the periodical La Vie Moderne as the inspiration for his choice of vocation. Indeed Signac wrote to Monet asking for advice and Monet’s helpful reply and their subsequent meeting in Paris ensured that Signac remained a devotee for the rest of his life. The death of his father and the sale of the family’s successful businesses provided Signac with lifelong financial security. Rather than become an architect as his family had wanted, he was able to pursue his interest in becoming a painter. Consigned by some to the footnotes of history as a mere follower of the great Seurat, he has been seen as noteworthy for his friendships with many celebrated artists, his tireless promotion of the Neo-impressionist cause and his involvement in radical politics – a good artist but always in the shadow of Seurat. And indeed Seurat, jealous of his position as the Neo-Impressionist pioneer did nothing to allay this perception. It was Signac’s friend Félix Fénéon who wittily observed that Signac had become the Claude Lorrain of Neo-impressionism to Seurat’s Poussin. This observation would infer a relationship of near equals – Seurat’s cerebral, scientific agenda balanced by Signac’s perhaps less dogmatic approach as is shown by Signac’s fondness for quoting his friend Fénéon – ‘we are in the Studio, not a Laboratory’. After Seurat’s death Signac, while never undermining the originality of his friends art, permitted himself to suggest that his somewhat different approach may have had some influence on Seurat. Paul Signac produced a substantial body of brilliantly expressive work extending to more than six hundred paintings and many more watercolours. After Seurat’s tragically early death, it was Signac who became the energetic chief proselytiser for Neo-Impressionism and the de facto leader of the group. In 1899 he wrote a book entitled D’Eugène Delacroix au néo-impressionisme in which he traces a direct evolutionary development from Delacroix through Impressionism to the more rational methods (as he saw it) espoused by the neo-impressionists. Signac had no formal training as an artist except for a brief spell attending the studio of a minor academic painter. Instead, he studied the work of Manet, Monet and the Impressionists and worked en plein air, roaming along the banks of the Seine in the locality of Asnières where his mother had moved after the death of his father. But it was undoubtedly his meeting with Georges Seurat during the inaugural Salon des Indépendants in May 1884 where he saw Bathers at Asnières (no doubt reminding him of his painting expeditions to that very place) which was the defining moment of his artistic career. In many ways they were opposites – the mainly self-taught Signac was a genial extrovert, but could be occasionally abrasive, not to say violent, whereas Seurat was distinctly aloof. 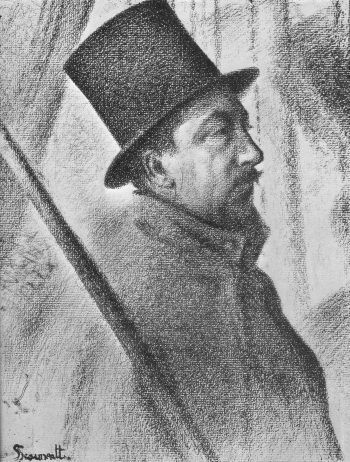 However Seurat’s academic background proved to be an inspiration for Signac who was seduced by the older painter’s rigorous theories, in many ways as we have seen, the antithesis of the spontaneous, instinctive, approach of the Impressionists from whom Signac had previously taken his lead. Now, Seurat provided an entrée for a new art, helping to hone Signac’s raw untutored style. The youthful Signac was already cultivating a wide-ranging circle of friends and acquaintances including many younger artists who would later form the core of the Neo-Impressionists as well as some of the older impressionists and a multitude of writers, critics and poets such as his future close friend, the critic Félix Fénéon and the influential writers Gustave Kahn and Robert Caze. By the time that Seurat’s An Afternoon on the island of the Grande Jatte was exhibited at the last Impressionist Exhibition, together with works by Signac and Camille and Lucien Pissarro, it was obvious that a new movement was under way. This was confirmed shortly afterwards when the Grande Jatte was again shown at the Salon des Indépendants. It was Signac who became the central figure in trying to pull together the disparate agendas of a number of artists who took up the challenge posed by the new ideas and techniques inherent in the works on show. It was his boundless enthusiasm combined with his very considerable promotional and organisational skills which ensured that the Neo-Impressionists, as they were now called, were able to show their works at exhibitions and that their paintings were then reviewed in the relevant periodicals. In a very short space of time Signac had risen from an also-ran self-taught artist to occupying a position of some prominence in the Parisian avant-garde. 1884 Signac is a founder member of the Salon des Indépendants; he meets Georges Seurat (who is exhibiting Bathers at Asnières), Henri Edmond Cross and Charles Angrand. He begins to attend soirées of the literary Symbolists at the Brasserie Gambrinus (near the Odéon on the left bank). He also meets Félix Fénéon. 1887 Meets Vincent van Gogh who is influenced by Signac’s divisionist style. 1892 Sails his new yacht Olympia from Brittany to the Mediterranean via the Canal du Midi. Rents a house in Saint-Tropez. Marries Berthe Roblès. 1904 Visits Venice. Matisse works with Signac at Saint-Tropez. 1914 Divides his time between Antibes and Saint-Tropez.